Strange noises under the back step! We've had hedgehogs living under our back door step for some years now, and often can hear them moving around. One hedghog snored terribly during the winter months!! The noise that caught my attention this morning is altogether slighltly more disturbing, but I think she might be giving birth?? Any other suggestions?? I hope the link works.....! Re: Strange noises under the back step! I will be honest and say I don't know!! The first thing that came to mind was mating, but surely it's a bit late for that? Are you able to lift the step to look? I meant to put another posting on yesterday, but I forgot. I've now discovered that our hedgehog has a cough!! I put some beef cat food out for it on Sunday night and I heard it moving about the garden and then I heard the noise again! Did the same again last night, and heard it again. As I'm now back at work I'm not able to listen to it during the day. Yes, it would be possible to lift the back step but we've always been wary of doing that as we don't want to frighten them off - it's actually a really nice thought that there's one under there! If that's coughing then it indicates lungworm as far as I know. I have to be honest, I haven't actually heard a hedgehog cough. The wormer which has been indentified to deal with lungworm in hedgehogs in Telmin - a horse wormer. 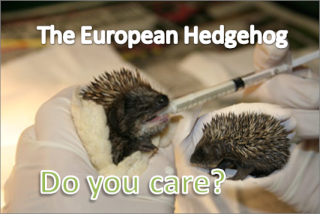 A kind vet who understand hedgehogs may give it to you, some of us get it online. It's nice to know you have Hedgehogs living in your garden.